Eddie Smith is a chubby bear of a guy who lives in Daytona Beach and doesn't work much anymore but isn't retired. Whit Hall has just retired as a tight end for an NFL expansion team and lives in San Antonio. At 52, Eddie feels at home with himself and has learned how to roll with life. He's happy enough where he is and doesn't expect much to happen anytime soon. At 35, Whit is ready for a life that put less of a strain on his body. He's banked plenty of dough but doesn't know what to do next. About to sit down to his favorite take-out lasagna, Eddie gets a call from a friend who wants to hire him to help Whit figure out what's next in his life. Eddie is a kinda, sorta life coach and might be able to help but seriously doubts it. Reluctantly, he climbs aboard his friend's private jet and flies to San Antonio. Once he arrives, he ends up getting a whole lot more than he bargained for. Whit Hall is aggressive, he's angry, and he's under a lot of pressure. It's a good thing Eddie (sorta) knows what he's doing! Now that he's retired, Whit is looking for the next thing. He's set, with plenty of bank. And he's doing what he can to deal with his parents, who are all up in his business. A lot. Then, one Wednesday morning, he opens his front door. 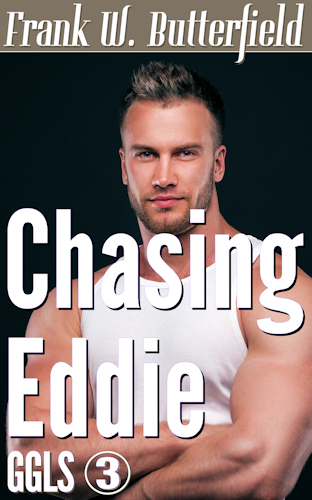 Before he knows it, Whit is chasing Eddie Smith out of his house, down the street, and even further. It's a good thing Whit is (kinda) in shape for this new type of chase! Wherever they end up going, and whatever ends up happening, this will be the beginning of something new and wonderful for them both. This 45K word stand-alone contemporary male/male (MM) romance involves a chubby bear guy and a retired professional football player. This story is the beginning of a series of contemporary romantic adventures. It ends with the start of one of those, so there are some loose plot points but no cliff-hanger. Golden Gate Love Stories are all about the lives and loves of men who fall in love with each other and find the one they were waiting for. Set in the same universe as the Nick Williams Mystery Series and the Daytona Beach Book Series, these love stories focus on the men who come together, find true love, and really do live happily ever after. Set in the same universe as the Nick Williams Mystery Series, these love stories focus on the men who come together, find true love, and really do live happily ever after.